Gamification by @victormanriquey: Gamification World Congress 2014: Epic Win! Gamification World Congress 2014: Epic Win! The third edition of the Gamificatation World Congress was one of a kind. You know it's going to be an epic one when people such as Nick Pelling, Mario Herger (@mherger), Kevin Werbach (@kwerb), Jaume Juan (@jaumejuan), Andrzej Marczewski (@daverage), An Coppens (@GamificationNat) Alberto Tornero, Bart Briers (@BartBriers), Thijs de Vries (@thijsdevries), Joaquín Perez (@Joaquin_perez), Juan Valera Mariscal (@valeramariscal), Isidro Rodrigo (@isidrorodrigo), Oscar García (@kokopus_dark), Emiliano Labrador (@emil_lab), Esther Hierro (@esthima), Iosu Recalde + Iñaki Huarte (@ouiplay) and so many more good friends (you know who you are guys) are "in da house". And if all of that is organised by Jose Carlos Cortizo (@josek_net) and Sergio Jiménez (@gamkt), both of them true experts in creating amazing events, there's almost nothing that can go wrong. And it didn't. It all started with our own "selfie" moment. We had just entered the main congress room and it was already about time to take a pic with some of the awesome people that we've come across along these past months. People that all have different backgrounds but a goal in common: to make the world more fun and engaging. Without even realizing that the #GWC14 had already begun, we quickly started to dive into Mario Herger's (Enterprise Gamification Consultancy) Enterprise Gamification Workshop. Flying Angry Birds, eye-catching videos and quite some great jokes for a nice session. Next workshop was Sergio's one, a really practical session where we came to know more about the Gamification Canvas Model and how to use it for gamification design. Andrzej Marczewski (Capgemini) was in charge of the day's third workshop, mostly focused on how to deliver great experiences to different player types. Andrzej's and Sergio's (Game on! Lab) sessions were pretty much complementary and I could even adapt my 35 Gamification Mechanics Toolkit to both their frameworks in a way that I didn't thought of before. So that was quite an epic one. Thanks guys! And as they usually say, last but not least, we had a fantastic chance to enjoy and learn by doing with Alberto Tornero's (PriceWaterhouse Coopers) workshop about the legal issues of gamification. As a person that has studied law for +5 years it was such a great and unexpected thing to gain some legal knowledge on the world of gaming withouth even mentioning one single law. Epic Win! And if one might think that it was enough for the very first day, there was more coming! The organisers' team had prepared a Candy Crush like dinner (sweet and delicious) for all the speakers that I truly enjoyed. So many interesting people in a nice and easy spot at one of the hotel's lounge terraces. Spanish tapas and a non gamified wine for a relaxed dinner. Good fun! All of sudden the lights went off and a fancy retro astronaut appeared shouting: Houston we have a problem! People are not engaged! One of the most epic kick-offs I've ever seen. After our favourite astroman had faded away into the smoke, it was about time to start listening to all the great people that had come to speak at the #GWC14. We started off with Nick Pelling's keynote on the present and future of gamification to move forward to Panzer Chocolate, a gamified transmedia horror movie that looked pretty interesting. I'm not a true fan of horror movies but what came next made up for it: Isidro Rodrigo and Jaume Juan came up on stage to talk about gamification and human resources. A really funny, full of content and truly enjoyable, low-cost approach to gamification was presented by Isidro Rodrigo (Dummymedia & GSM labs) while Jaume Juan (Compettia) focused on a gamified experience called "Retame" based on a quizz like mechanic that seems to deliver great results! Both Isidro and Jaume were fantastic and Mario Herger's talk was the icing on the cake. The first round of talks ended up with an interesting gamified case by Royal Canin. After a short but quite "networked" coffee break we went back to our seats with Carlos Guardiola (Medianet) and his "Who gamifies the gamificators". An amusing keynote on gamification and human resources that led to Bastian Kneissl's (MaptoSnow) talk on their startup's SaaS platforms: MaptoSnow, MaptoBike & MaptoHike. Really interesting apps and time to listen to one of the #GWC14 organisers: Jose Carlos Cortizo (BrainSins) and his always fantastic lessons on eCommerce. Truly inspiring! We moved forward with Michiel van Eunen whose keynote about "The Hunt" experience seemed "super leuk" and really interesting as a human resources best case, Miguel Ángel Gómez on The Travel Club (Travel Club) case, and Daniel González (Redbility) that came up on stage with a cool toolkit that measured his brain activity to talk about Neuro-gamification. Quite an intense ending to finish off the seconf part of the event's great talks. Time for lunch and back for more! What I really thought before getting on stage was: let's come up there with all my energy and see if it works out! Finally, and as people told me afterwards, it was quite a useful talk for many of them, so +1 Life! After The Engagement Circle (see keynote slides below or here), turn for Brian Burke's (Gartner) digital gamification, Toby Beresford (Leaderboarded) and his interesting talk about the Zoopla's case, Fran Gago (Gamifik) on Tommy Mel's case and Thijs de Vries (Creative Seeds) and his cool talk on students' motivation! And last but not least An's keynote! I could say a lot about An Coppens' talk (Gamification Nation) at #GWC14, but I'd rather let you see this video. Thank you An for such a wonderful one! That was quite an epic one! But the congress was not over yet (there was way more coming!). Turn for Andrzej Marczewski's talk on his user types, and that was as great as it always is! We then had the chance to listen to Bernardo Crespo (BBVA) on the BBVA game, Juan Valera Mariscal (Humana Mente Posible) and his interesting talk on gamification and psychology and Javier Molina & Antonio Agromayor that presented the new variables of loyalty. Finally, and as a fantastic way to close the event's second day, we had Kevin Werbach on how games can teach us a lot about learning. It was a pleasure to meet Kevin (good person, better professional) and share some thoughts on gamification. Truly epic! We could not finish off this blogpost without mentioning Bart Briers and his WONDERFUL talk. It was inspiring, jaw-dropping, eye-catching and brilliant. We were all waiting for his guitar, his fancy orange wig and his unique Annie's Song. Nothing of that happened, but guess what: It was way better! So that was all about the event's second day talks... Time to get changed and enjoy the GWC14 evening! After a really intense day, we all thought it was kind of over. Such a good thing we were wrong! 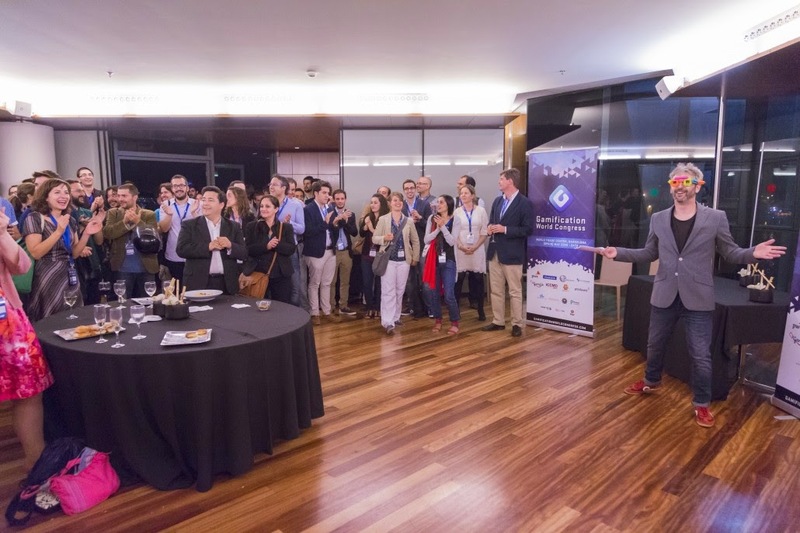 The #GWC14 organisers had prepared a fantastic networking party at the event's venue!. Lots of great people, the first Gamification World Awards presented by the great Iñaki Huarte & Iosu Recalde and way more! Yu-kai Chou was chosen the #1 Gamification Guru followed by Mario Herger and Andrzej Marczewski. I got the #8th position worldwide, which it honestly felt like a first place for me considering who was on top! Unfortunately, I could not attend the event's last day (Gamification, Health & Educacation) but so much looking forward to hearing all the insights from the people that could make it! So that was all about the legendary experience at the Gamification World Congress, the biggest event of Gamification worldwide with more than 600 people! Thanks to everyone that made it possible and a BIG THANK YOU to all the epic people and good friends that we met (and got to know) there.